The FT-991 is an traditional superheterodine quadri-bands! 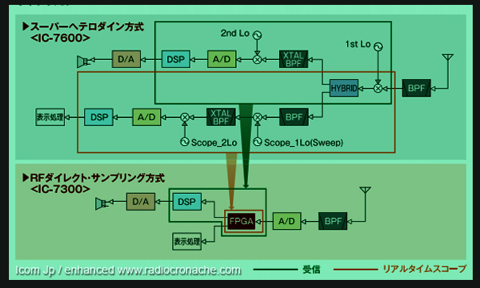 The new IC-7300 adopt the latest RF direct sampling method (BPF >A/D >FPGA >DSP >D/A – see the Icom block-diagram below) and it is equipped with a high-performance real-time band scope on large TFT display! Instead of the conventional superheterodyne system, the IC-7300 utilizes the RF direct sampling system — a first in an amateur radio transceiver. This technology is seen in Software Defined Radios and other radio equipment. RF signals are mostly processed through the FPGA (Field-Programmable GRate Array), making it possible to eliminate physical mixer and filter devices and offer a high performance real-time spectrum scope in a compact body. * Researched by Icom, among major amateur radio manufactures. This is the first SDR from one of the big three (Icom/Kenwood/Yaesu), it's definetely a good step in the right direction. Looks to be aimed at field operations, competing with the Yaesu FT-991. Still not sure about the price, the 150.000yen price tag seems a bit low and might be for the cheapest of the series, the 10W model. Also covers the 70MHz band, by the way.